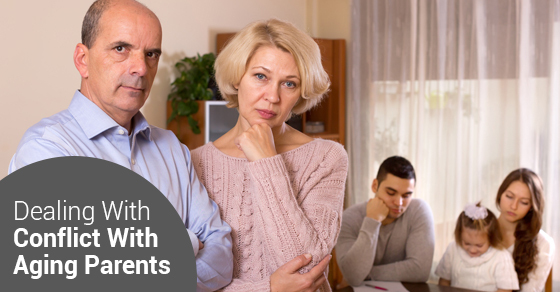 Conflict with an aging parent, although stressful, is very common. Perhaps your parents are unwilling to accept that they cannot keep up with daily tasks that they once did every day. They may be hostile because acknowledging that they cannot do these things anymore because it would mean that they are admitting to their losing independence. Although this type of conflict can be difficult for everyone involved, it may be helpful for you to know that there are ways to diffuse the tension. Home health care, whereby elderly patients receive customized services and care while remaining in their own home, is a very beneficial option for many seniors as it allows them to retain their independence while having some assistance. Home health care services provide assistance with everything from grocery shopping to light housekeeping and more. Many elderly people are open to this type of help because it is not threatening to their sense of independence. To avoid escalating the problem further, it is helpful to address the situation when you know you will not lose your temper or say something out of anger. Avoid talking to your parents as if they are children and other patronizing treatment. Ultimately, you want to treat them how you would want to be treated if you were in the same position. It is important to try to identify the root cause of the conflict—perhaps your parents are afraid of the possibility of going to a nursing home. Regardless of the root cause, it is important to consider that there is something behind the conflict when developing a plan of action for the future. If you are comfortable with it, sometimes it can be helpful to bring in a third party—such as another close relative—to offer his or her perspective on the matter. At times, parents may be unwilling to listen to their children but willing to listen to others. In your role as a caregiver, it is important to accept as much help as you can to avoid burnout. If the conflict is related to your parents refusing to accept help, bringing in a third party to help with small tasks can be a good compromise that doesn’t seem as threatening.